4 days hands-on training for COA exam preparation and dig into details of cloud concepts and technologies, and how to configure additional OpenStack services. In this 4 days hands-on training, students use a hybrid environment, configure ManageIQ to work with OpenStack, Kubernetes and OKD, deploy virtual machines (VMs) with templates and customization, produce chargeback reports on VM and resource use and automations, and perform policy-based management. This course covers ManageIQ tenants, interface customization, timeline and event analysis, and service provisioning. 4 days hands-on training that provides an overview of the Ceph Storage architecture and its deployment. This includes deploying the Ceph Storage Cluster (RADOS), the Ceph Object Gateway (RADOSGW), and the Ceph Block Device (RBD). This course also covers integration Ceph with Glance, Cinder & Swift. 4 days hands-on training that provides a deep of the key of NFV technologies and their relevance with respect to OpenStack. 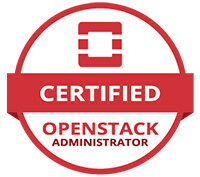 4 days hands-on training that provides how to install and configure OpenStack for high availability of controllers, networking, and computes. 4 days hands-on training with focus to managing OpenStack using the unified command-line interface, managing instances, and maintaining an enterprise deployment of OpenStack. This course also teaches the management and customization of an enterprise deployment of OpenStack (overcloud) and how to manage compute nodes with TripleO (undercloud). The OpenStack Engineering with Juju Training is an intensive 4 days hands-on course that will give you the best introduction to setting up and running Ubuntu OpenStack clouds. The training course will cover everything you need to know about Ubuntu Server in the cloud and will focus on building an Openstack environment using Ubuntu OpenStack and the best in industry cloud tools: MAAS, Juju and Landscape.